vSphere Platinum vs. vSphere standard: What's new? What's New with vSphere Platinum? VMware’s vSphere virtualization and cloud platform has become the industry standard for building and maintaining secure, high-performance hybrid cloud environments. However, the newest edition of the platform, vSphere Platinum, hopes to make the process even more refined with the help of machine learning. 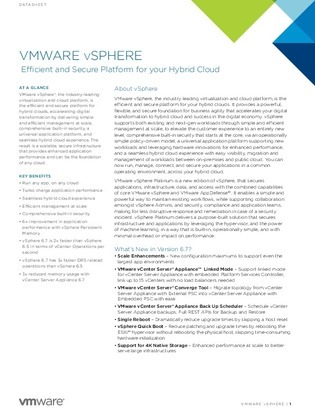 Download this white paper to read through the new features, capabilities, and configuration changes this new edition of vSphere brings to the table. Plus, find out how Platinum stacks up against the other iterations of vSphere available on today’s market.